No matter what industry you are in, like most people, I spend a lot of time behind the pixel box as a graphic designer. Actually, I enjoy designing on the computer, but it does take a toll on your body sitting in the chair behind a desk all day. I started to find having mild back pain and just being slow moving and sore at the end of the day. So I invested in a sit stand desk. What a game changer investment. See more here on where I got mine: https://www.upliftdesk.com. I picked up the generic version of the desktop (which was replaceable to the leg stands) and it was great for a long time. But then, like all designers, I ended up starting to sketch ideas for the desktop. I did some research and put together some ideas that I really liked– tricks like having a place to hang your headphones for quick access to a call that won’t take up space on the desktop. I also read about shelving or hidden space that hides all of the power cables for computer and other devices. Also, I thought it would be nice to have a place to jot down quick notes directly on your desk– just like a whiteboard for those quick measurements or to save on post-its for those quick notes. 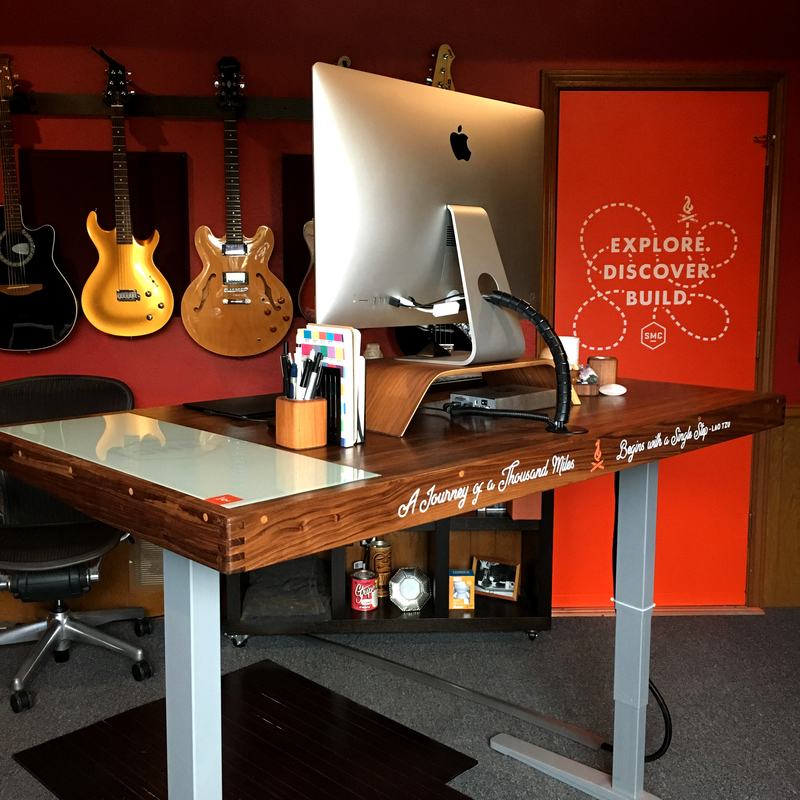 I had a buddy of mine who had built his own desk from scratch and it was awesome. So I reached out to him and said,”hey, you interested in a project.” And he was! After I tightened up my sketches, we got together and started to talk through it. Collaboration with another creative is great, but working on a passion project with a buddy who is a creative is why we do design in the first place. Lyn is old school when it comes to his woodworking hobby– he wants to do all the work with only wood and without hardware. Look mom, no nails! He has quite the studio setup with the converted garage set up to handle wood crafting projects just like this one no problem. Lyn is a lighting and composting director at Reel FX and has been in the special FX business for years– but woodworking is his passion hobby, along with photography and editing. With Lyn’s help, we totally transformed this desk! On the generic desk, I always struggled with having a place for coffee in the morning on the left and the layout pad on the right. Both mandatory needs for a designer. The first upgrade we did was just make the desk longer. This allowed more space for beverages on the left and a place to fit the layout pad perfectly on the right. Another upgrade we built in was the cable storage management shelve. The small shelf was built underneath the front of the desk. This created just enough space for a surge protector plug outlet and then add all the accessory cables within the shelf. Then all we needed was just one outlet hole that goes out to the top of the desk for the cables to run to the computer. 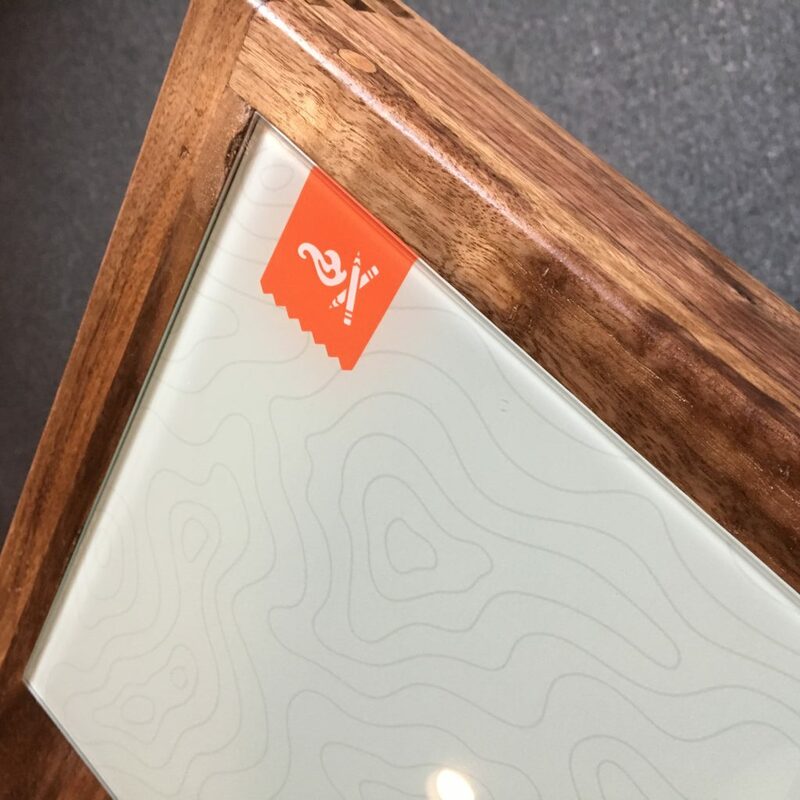 For the writing surface, we opted to use glass which functions as the whiteboard, but we could customize the look of it so much more with my brand. Plus, you can use permanent marker on the glass and just as easily wipe it off. The look is sleek and infuses my brand and is efficient and productive. And of course to top it all off, I have to drop in my branding. I popped in a branded graphic behind the glass that also worked as a reflective material to write on (instead of your generic whiteboard). I also added an inspirational line by Lao Tzu on the front that kind of talks to my tag line. To me, it not only talks about every step of life’s journey, but also every project I do. Sometimes the most difficult part of the project is just starting it. This also applies to channeling the tenacity to carry the project all the way through until the end, no matter what roadblocks or challenges you come up against. 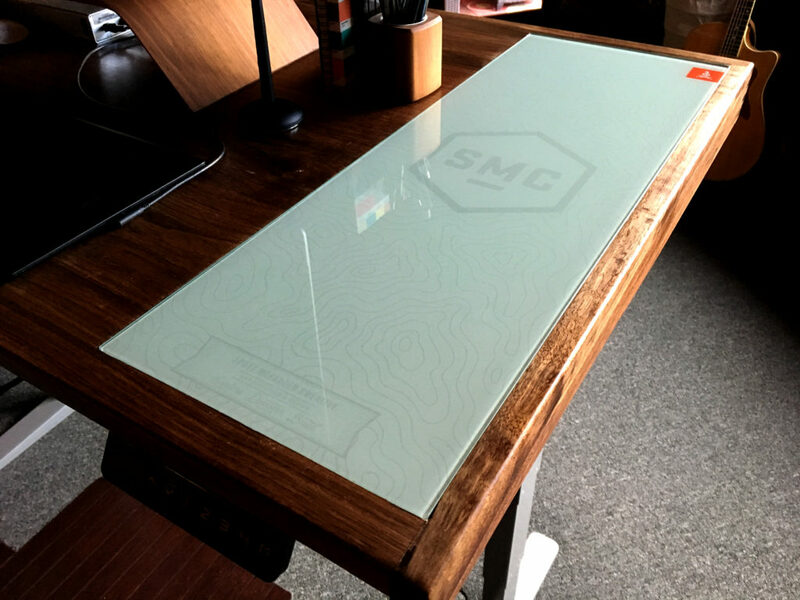 Why not have a functional AND inspirational desk? The desk is form and function for me. It’s made my daily experience in work flow a lot better, but as a designer, it is also nice to geek out with some nerdy art director projects for your own environment. I can’t thank Lyn enough and he has free drinks going to him for at least the next 5 to 10 years! 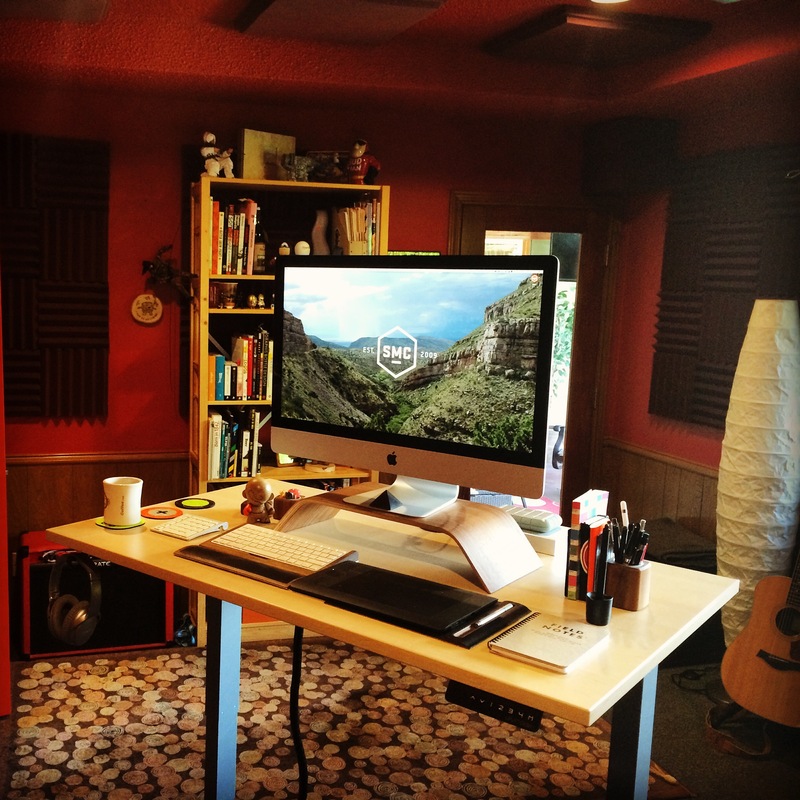 If it inspires you, I would love to hear about your own current workspace or future setups for sure! Comment below and let me know about your current work spaces! To see more of my passion and design projects, follow me on instagram! 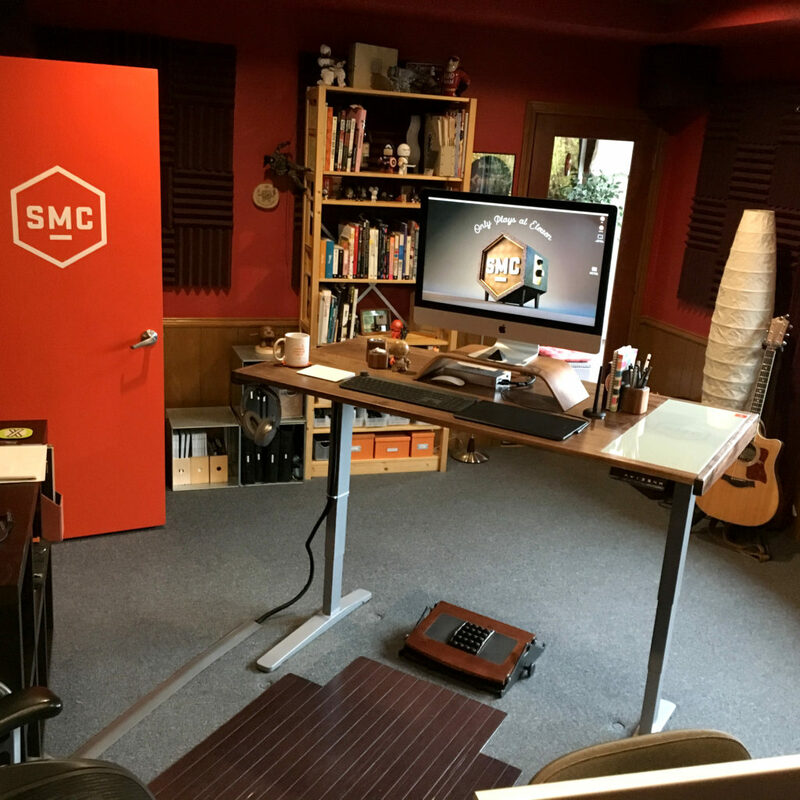 @https://www.instagram.com/scottmcfaddencreative/ I would love to see what you all have going on in your work spaces!